That's Incredible! is an American reality television show that aired on the ABC television network from 1980 to 1984. In the tradition of You Asked for It, Ripley's Believe It or Not! and Real People, the show featured people performing stunts and reenactments of allegedly paranormal events. The show also often featured people with unusual talents, such as speed-talker John Moschitta, Jr., who made his first national television appearance on the show, as well as scientific, medical, and technological breakthroughs such as the Taser and cryogenic corneal reshaping by lathe keratomileusis. The show's catchphrase said by one its hosts at the conclusion of a particularly amazing segment was the same as its title: "That's incredible!" 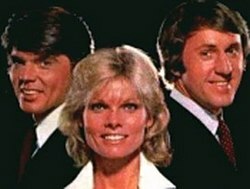 The show was co-hosted by Fran Tarkenton, John Davidson, and Cathy Lee Crosby, and was produced by Alan Landsburg Productions. Originally aired as an hour-long program, episodes were later re-edited into 30 minute segments for syndication. It debuted on March 3, 1980. A number of the stunts performed were dangerous, including juggling knives, staying inside a small box for hours, and one involving a man supposedly catching a bullet between his teeth. The dangerous nature of these stunts eventually prompted producers to augment the footage with the caption "Do Not Try This Yourself". Steve Baker, also known as "Mr. Escape", was frequently featured on the show. The show has been cited as an influence on hip-hop culture in New Zealand, where much television programming in the 1980s was American. In 1983 the show featured several dancing crews, giving youth of Pacific Island and Maori heritage, many of whom were interested in hip-hop culture and dance, a sense of connectedness to global youth culture. In the early 1980s, Army Lt. Col. Earl Woods (Ret.) brought his son Eldrick to That's Incredible, showing his ability to putt a golf ball into a hole from different areas. Eldrick is now better known by his nickname Tiger. The show ranked in the top 30 for its first four seasons, and ranked in the top 10 during its first season, but fell out of the top 30 in its final season. In 1980, Time magazine named That's Incredible "The Most Sadistic" show on television. Those Amazing Animals is a reality television series about animals and their extraordinary lives. It was hosted by Burgess Meredith, Priscilla Presley and Jim Stafford. Also appearing were explorer Jacques-Yves Cousteau, undersea photographers Ron & Valerie Taylor, and Joan Embery of the San Diego Zoo. The series aired on ABC on Sunday nights from August 24, 1980 to August 23, 1981. That's Incredible! was revived in 1988, hosted by Davidson, Cristina Ferrare, and Tracey Gold and was renamed Incredible Sunday. It lasted only for the 1988–1989 season. The show was seen weekends on Retro Television Network. Mentioned in Black Flag's 1982 song TV Party as one of the band's favorite shows. On February 14, 1983, the Fray children, as adults, appeared on the program following the premiere of Who Will Love My Children?, a film about the life of their mother. On February 21, 1983, That's Incredible unwittingly gained video game immortality by broadcasting the North American Video Game Challenge—an international video game tournament filmed at Twin Galaxies in Ottumwa, Iowa—which since then has gained recognition as being history's first video game world championship. In a Season One episode of The Goldbergs, Beverly Goldberg calls the show, which her husband Murray watches, stupid, who retorts "Stupid? Is it stupid that a baby can water-ski? Is it stupid that someone taught rats to play basketball? That's not stupid, that's incredible!" ^ The Complete Directory to Prime Time Network and Cable TV Shows 1946-Present. Ballantine Books. 2003. p. 1186. ISBN 0-345-45542-8. ^ The Complete Directory to Prime Time Network and Cable TV Shows 1946-Present. Ballantine Books. 2003. p. 1197. ISBN 0-345-45542-8. ^ O'Connor, John (14 February 1983). "TV: Ann-Margret Plays a Dying Mother of 10". The New York Times. Retrieved 2008-08-19. ^ "North American Video Game Olympics". Twin Galaxies. 21 February 1983. Retrieved 2008-08-19.